If you are looking for a beautiful home, this house is the answer! 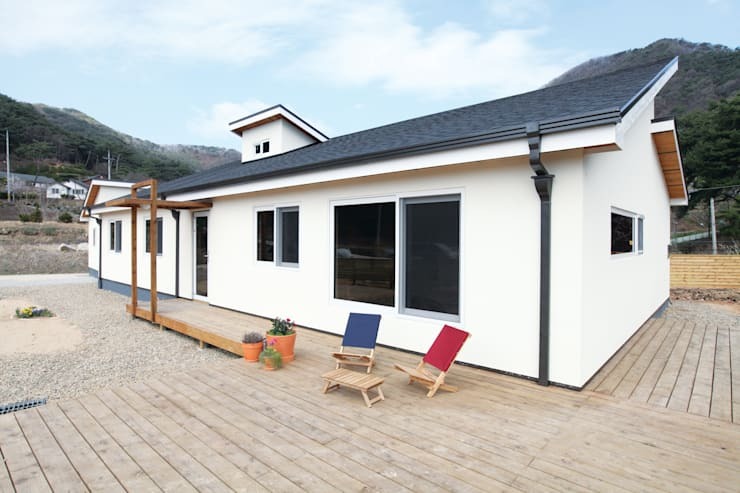 Today, homify will take you to a Korean house. 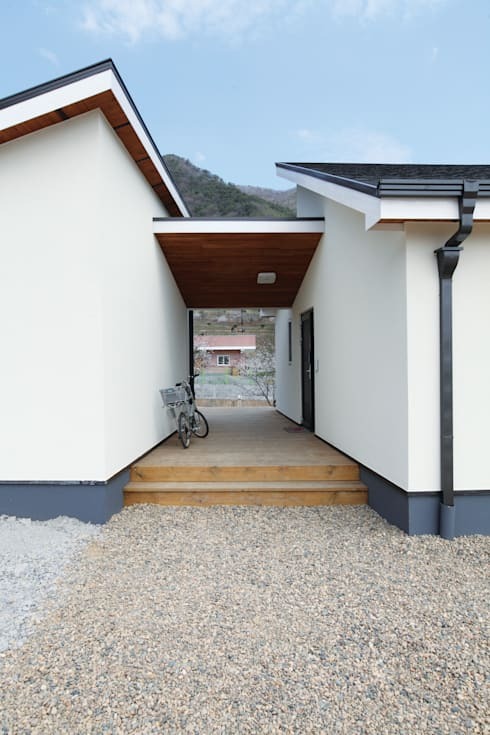 Be amazed with this single-storey, Korean house with a Thai-style terrain that suits it perfectly. Focusing on a simple design, the whole house looks spacious both inside and outside – good for large families that love to gather. Now, let’s go see this home better! If there is an available large outdoor area, then terraces would be wonderful! 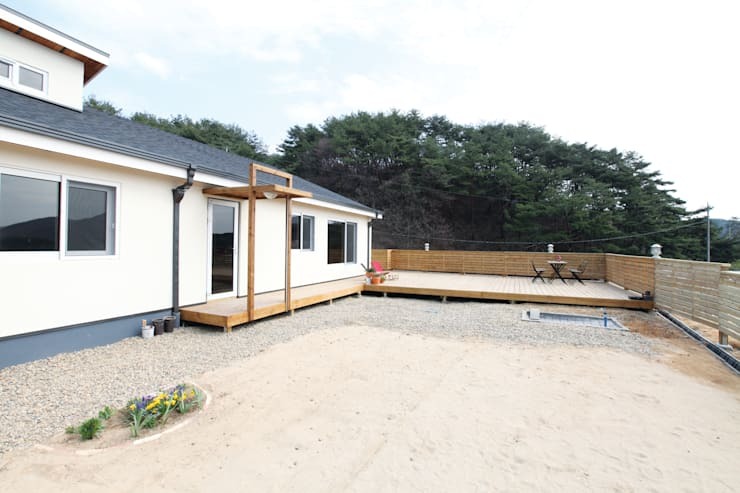 The terrace of this house is a large wooden one with several tables and chairs. See awesome terrace transformation, only here at homify! As you can see, the area is covered with sand and rock. The area is vast and wide, children can freely and comfortably play and run around. It would be also nice to plant trees to create a refreshing atmosphere. Now over here, the area is covered with sand and rock. The area is vast and wide, children can freely and comfortably play and run around. It would be also nice to plant trees to create a refreshing atmosphere. 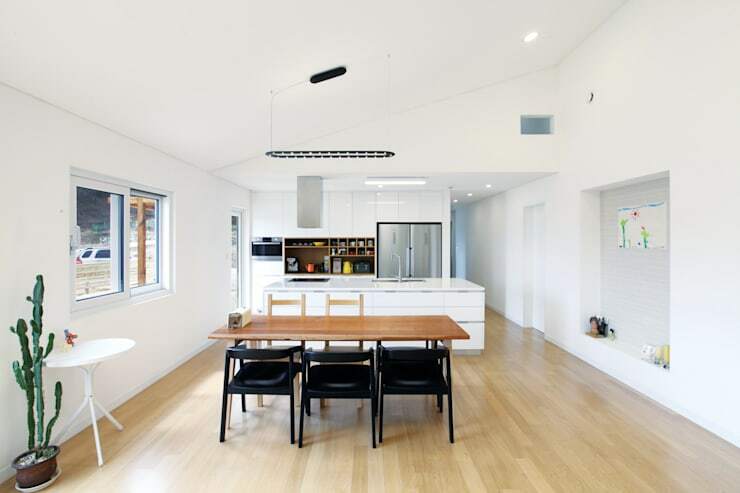 This house is a single-storey, white house with a sophisticated gray roof. Looking around the house, you can spot many windows running the walls, making sure you don’t just have style but also that daily dose of sunlight that you need. 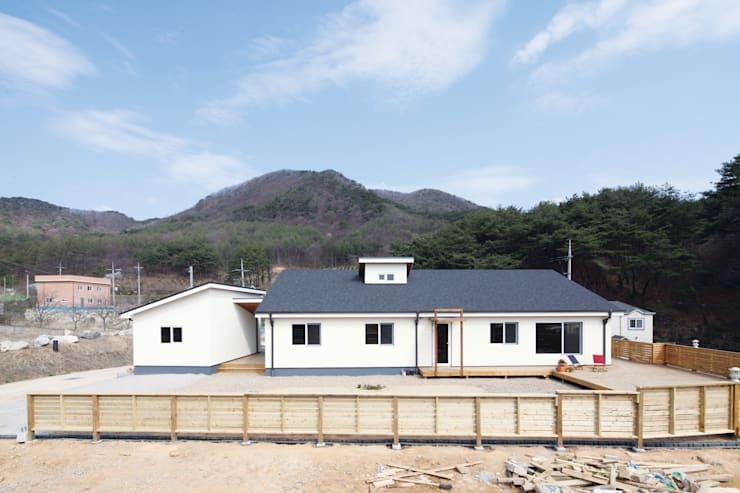 Korea has been known for being a quite steep, mountainous land. Therefore, the house must be built at the terrain. 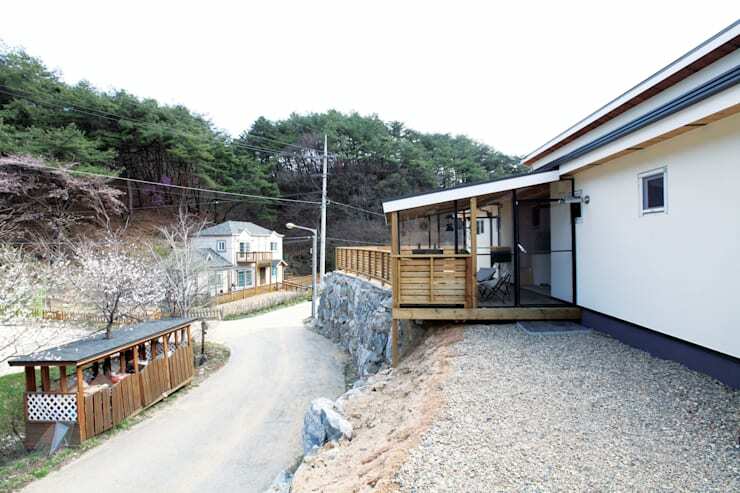 Like this house on a rocky cliff, the main street is lower than the house. The first room that we’ll examine is the bedroom. 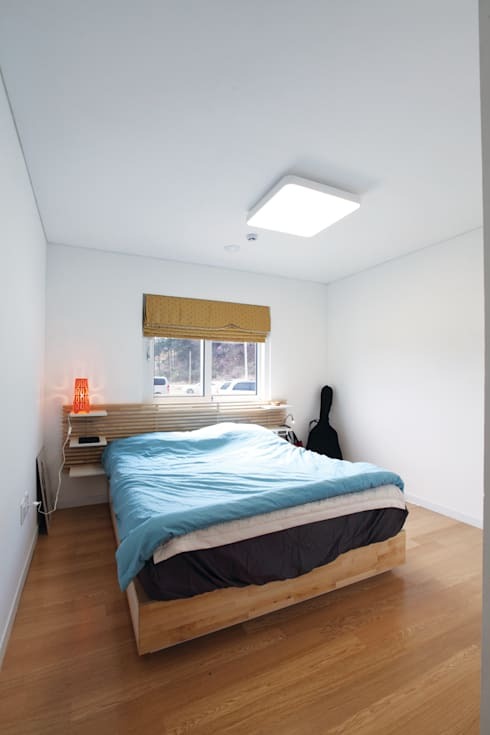 At first, this bedroom seemingly looks plain. But the white walls and wooden floors surprisingly produce a cozy atmosphere. The light that shines through the window near the headboard makes the bedroom look clear and bright. Waking up to this will ensure that your morning will be a good one. 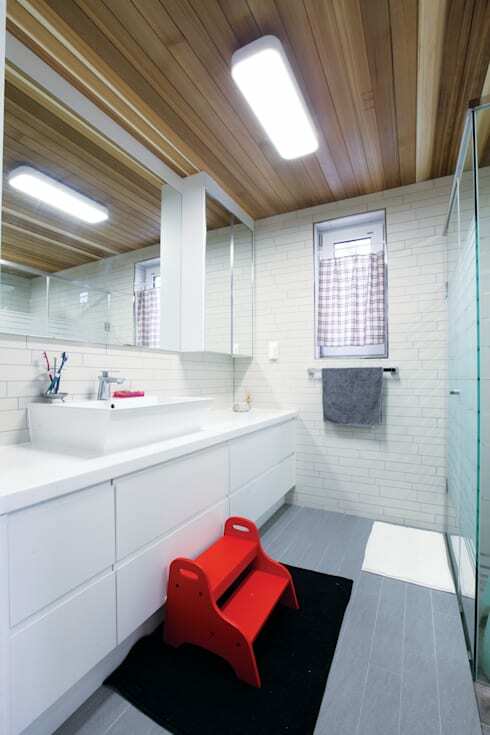 The bathroom is tiled in white color to make the bathroom look even wider and cleaner. Remember, a spick and span bathroom goes a long way – it says a lot about you and makes our shower moments a lot more relaxing. 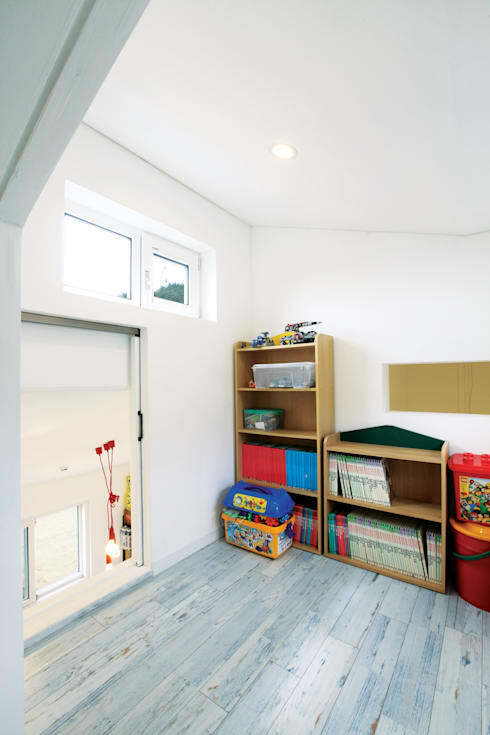 The children's room is a white room filled with lots of toys. On the other side is a bookcase for children's books. For children who are still small, they will need a book shelf suitable for them, one that is not too high. Children will be able to keep books in their place. 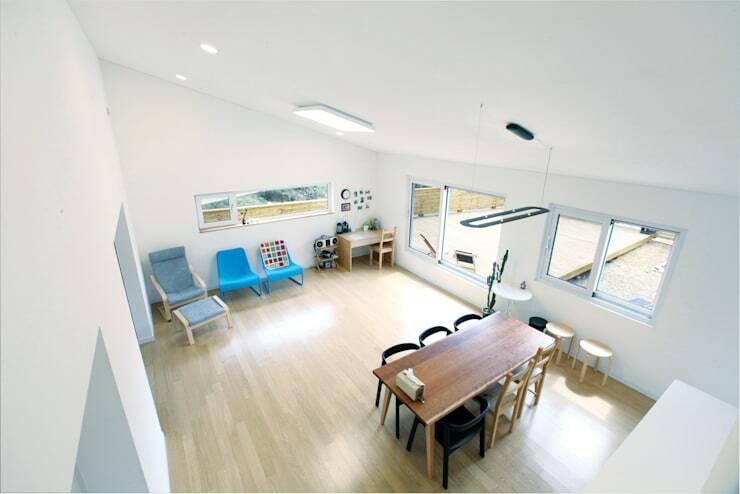 In this spacious room , we can divide into many corners, such as the living room corner, dinner corner and work desk. ill be welcomed by an ‘airy’ atmosphere. Architects choose a wooden dinner table to give a natural feel to the ambiance of the room. The white kitchen looks great. It is not big, but it is very good. In general, this house is a large, clear house that everyone in the family must certainly like.